Thousands have already begun the conversation. Needless to say, Spring Break is an annual rite of passage and Panama City Beach, FL is its most popular destination, bringing in roughly half a million students each year – more than all other destinations combined! Luckily for the organizers, all those students aren’t descending on the ‘world’s most beautiful beaches’ all at once. Spring Break spans over a six week period, beginning in late February, and ending in early April. Depending on which state you’re from or which school you go to, your break date will fall into one of those six weeks. 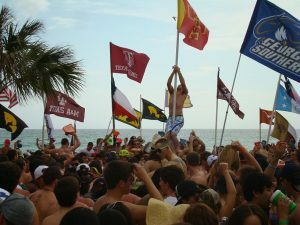 If you’re not sure as to when that date exactly is, or if you need to find out another school’s break date (so that you can co-ordinate your spring break plans with your friends), PCBeachSpringBreak.com has a list all prepared for you. Check out the break dates list by visiting www.PCBeachSpringBreak.com or by clicking here. Be sure to follow the exclusive PCBeachSpringBreak Facebook page and Twitter handle to stay in the conversation loop and to learn about various promotions and giveaways happening each month leading up to Spring Break 2013 in Panama City Beach.